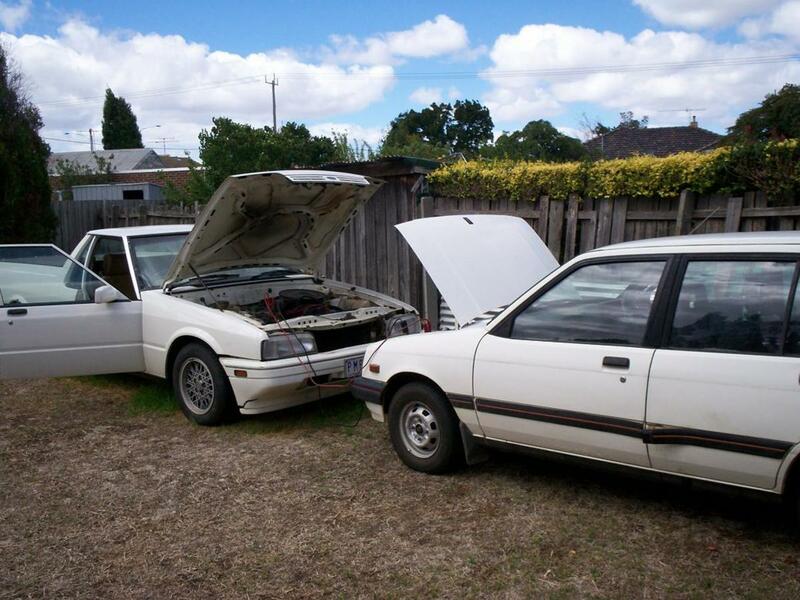 Hardlymoving writes about do-it-yourself maintenance and repair of Japanese cars. 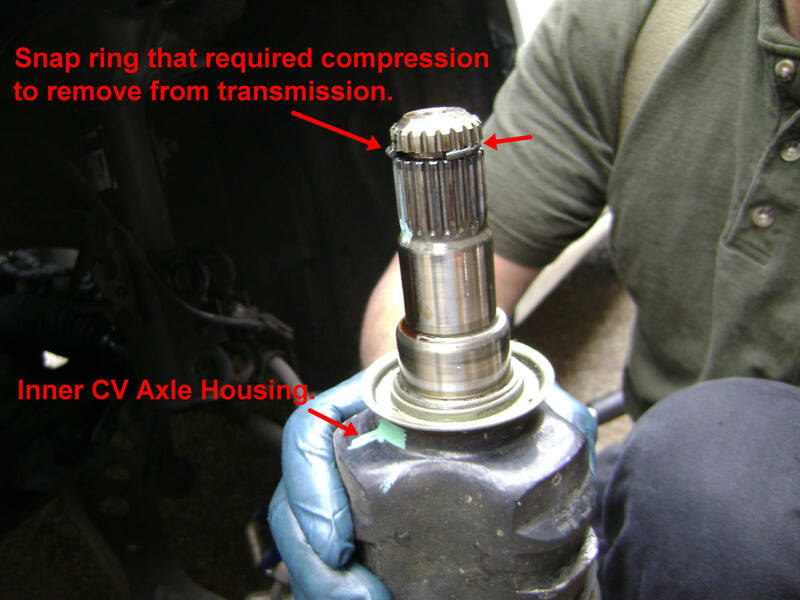 This article provides detailed steps for how to remove and replace the driver’s-side CV axle and its axle shaft seal. 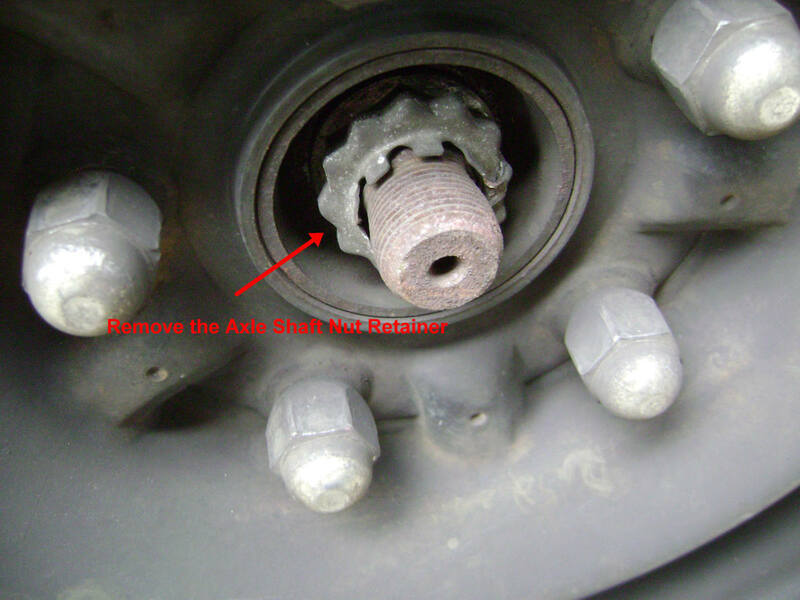 The axle's inner or outer boots may have split, the internal bearings may be worn (making noise during turns), or ATF fluid may be leaking from the axle shaft seal(s) seated in the transmission differential. This article does not address replacing the boots on a CV axle shaft. From personal experience, it is not worth the cost, mess, and time. New boots from your local parts supplier (if they have the boots available) usually run $20. Rebuilt as well as new shafts with a warranty cost around $70. If re-booting is the goal, might as well re-boot both the inner and outer boots… which now brings the cost to over $40. This translates to only a $30 cost savings to perform at least a 1.5-hour effort to re-boot, combined with a big grease mess and a lot of paper towels for cleanup. 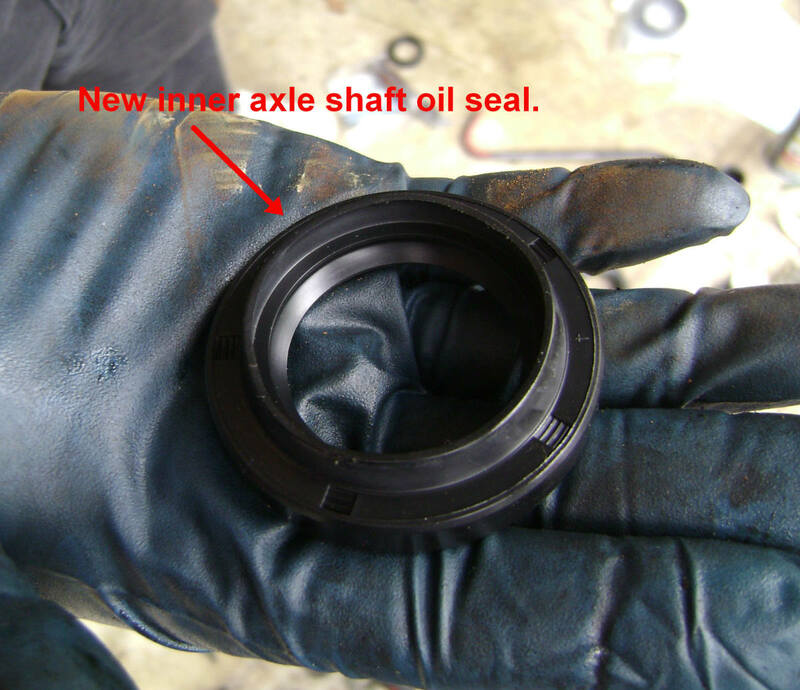 Regardless of whether the axle shaft is being replaced or not, the inner shaft (or differential) seal should be replaced. Older, high-mileage cars may have seal leakage due to dry rot, hardening with age, or slight damage during a shaft removal or installation job. The cost of a new seal usually runs less than $10. 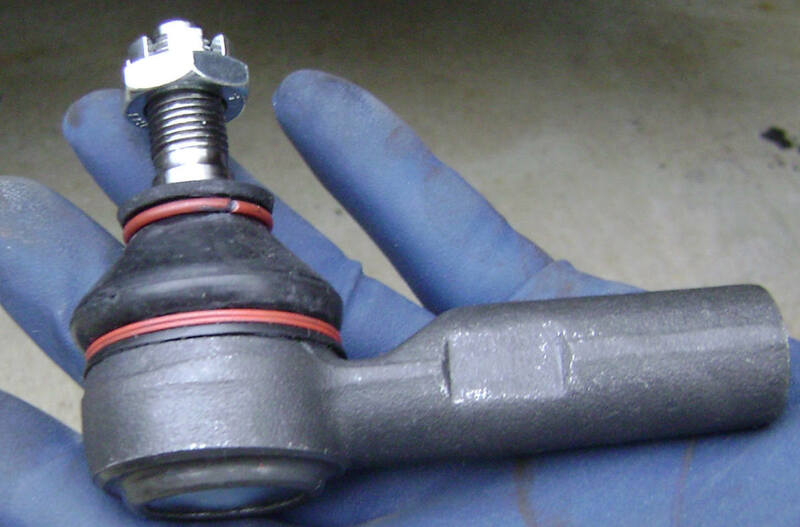 The outer part of the axle shaft can be separated from the steering knuckle by disconnecting the lower ball joint from the lower control arm. On the Camry and some other models, it requires less time and effort to detach the suspension strut from the steering knuckle. Although most prefer the ball joint removal method, detaching the two bolts securing the suspension strut to the knuckle is easier. 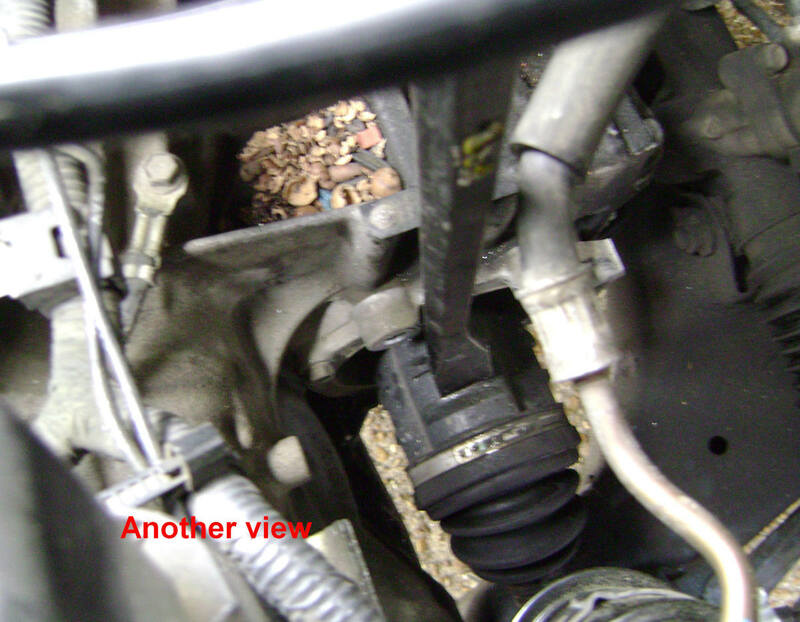 The Camry inner CV axle is recessed into the differential allowing no room to position a pry bar to "pop" the axle out. 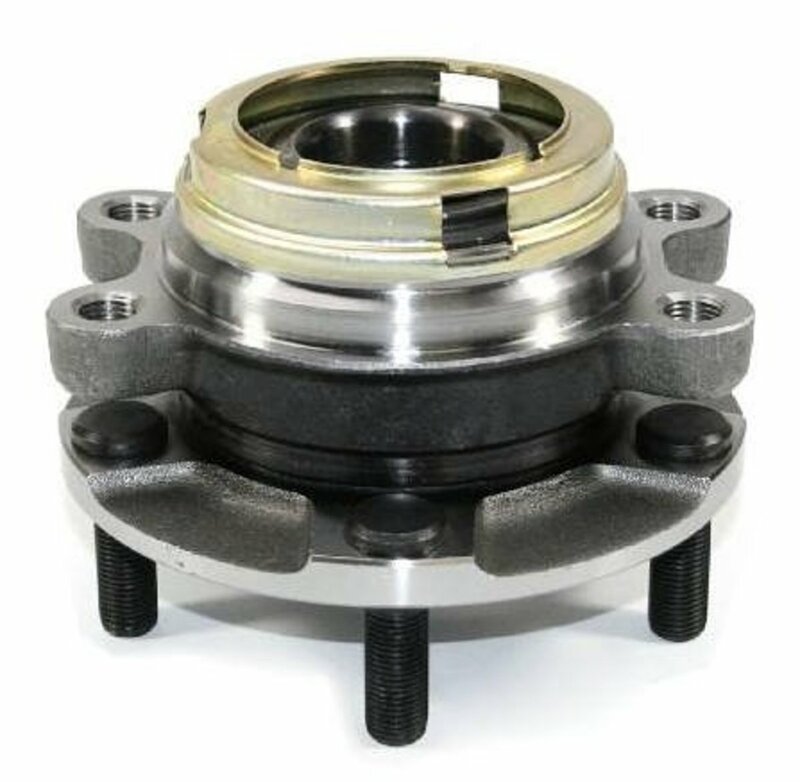 However, the inner CV bearing housing has three prongs or "ears" that provide a place where a pry tool can push. 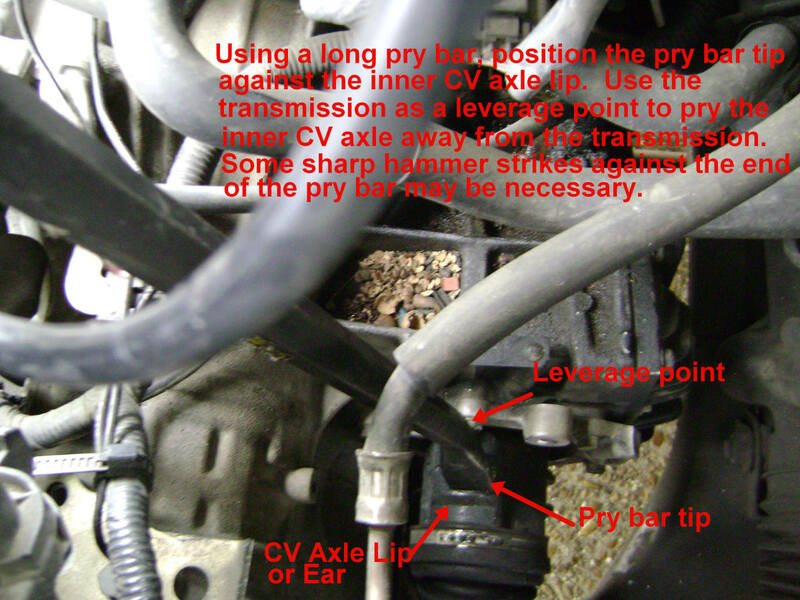 To gain adequate pry bar leverage against an ear to "pop" the axle shaft, position the pry bar from the top of the engine compartment. Or see the video below for another method to remove the inner CV axle. If a high-torque impact driver is not available, the nut tension can be relieved with a 32 mm socket attached to a breaker bar. 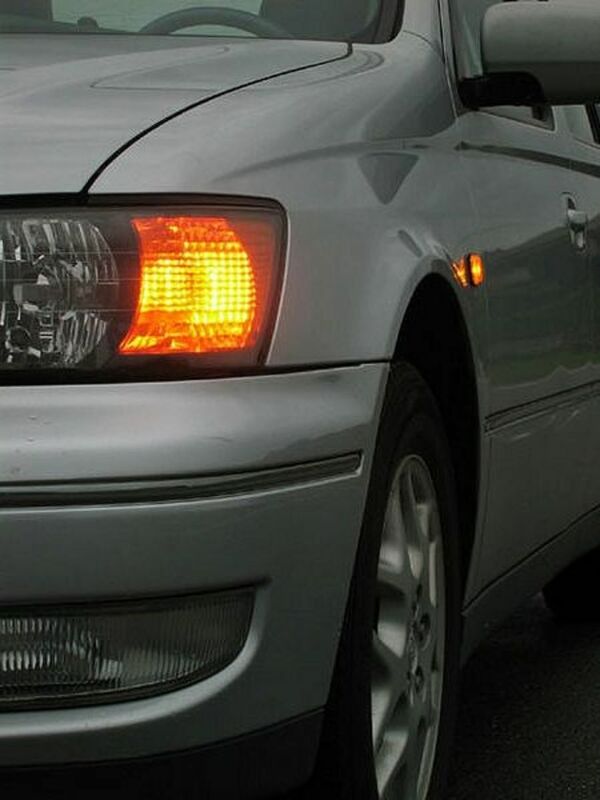 The axle can be prevented from moving by leaving the front wheel resting on the ground; that is, by not jacking up the wheel. Remove the axle shaft cotter pin with pliers. 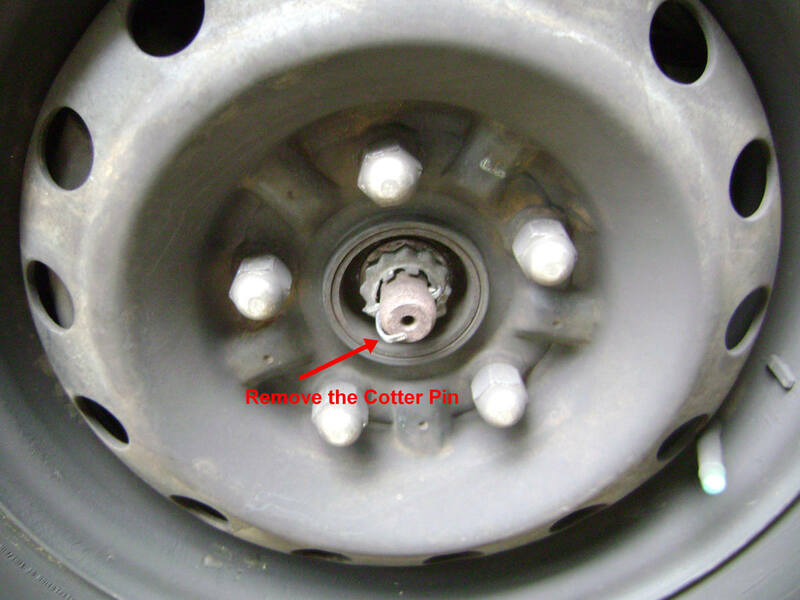 Remove the axle shaft nut cotter pin alignment cover. 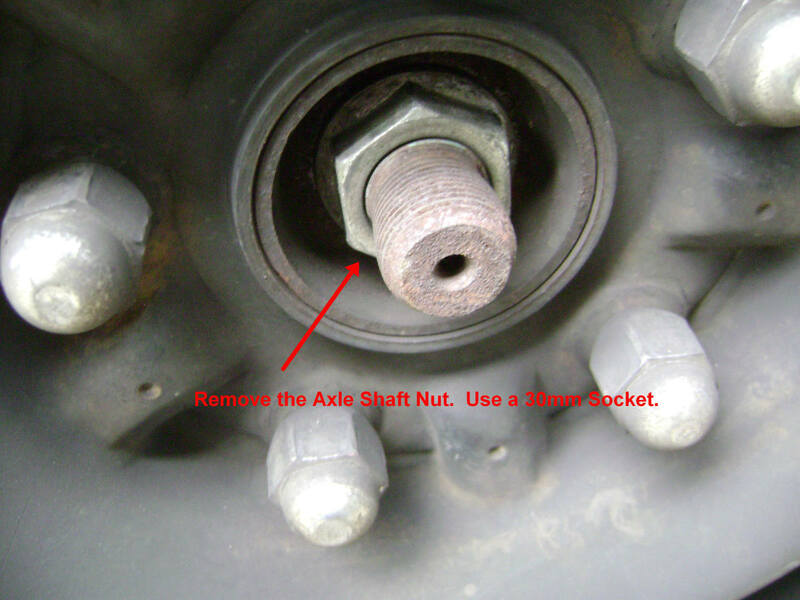 Remove the axle shaft nut. Draining the fluid before removing the shaft will avoid transmission fluid gushing out the differential after the shaft has been pulled out. The drain plug can be removed with a Hex socket. Approximately 2.75 quarts of ATF should drain out. The oil can be saved and reused if the no dirt or grim drops into the drain pan. Screw back in the drain plug and tighten. Do it now or you might forget. 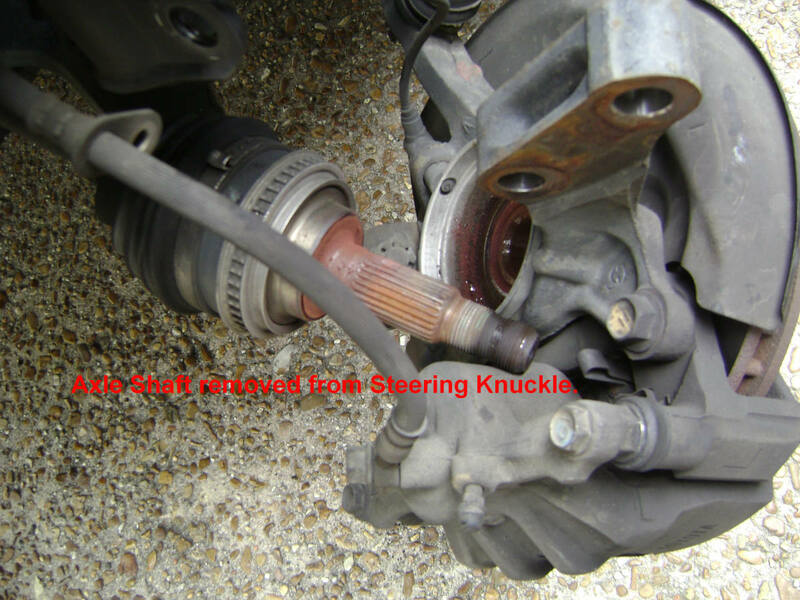 Remove the two bolts and two nuts that secures the strut to the steering knuckle. Remove the brake line bracket bolt. Jar the axle shaft loose from the wheel hub. 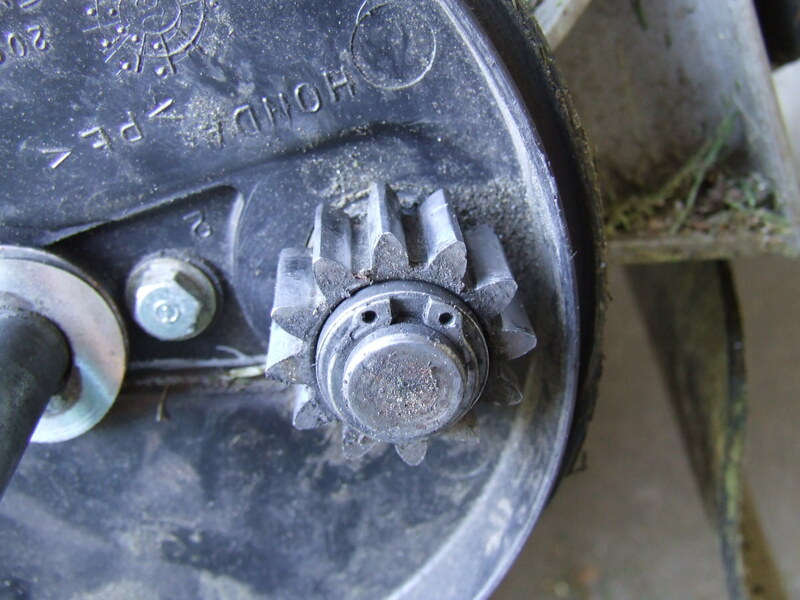 The axle shaft splines may be stuck to the wheel hub. 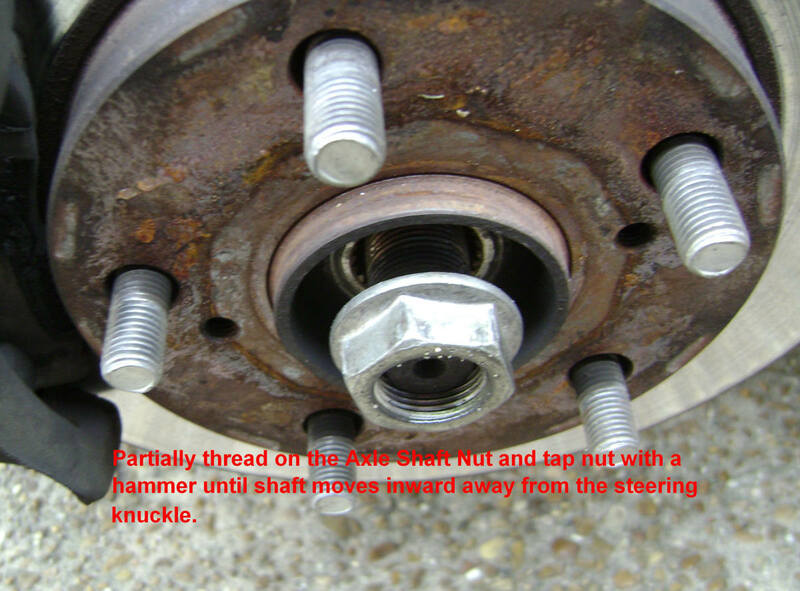 If a few light taps with a hammer does not push the shaft in, partially thread back on the axle shaft nut on to the axle shaft. This will allow harder hammer impacts on the shaft without damaging the shaft threads. 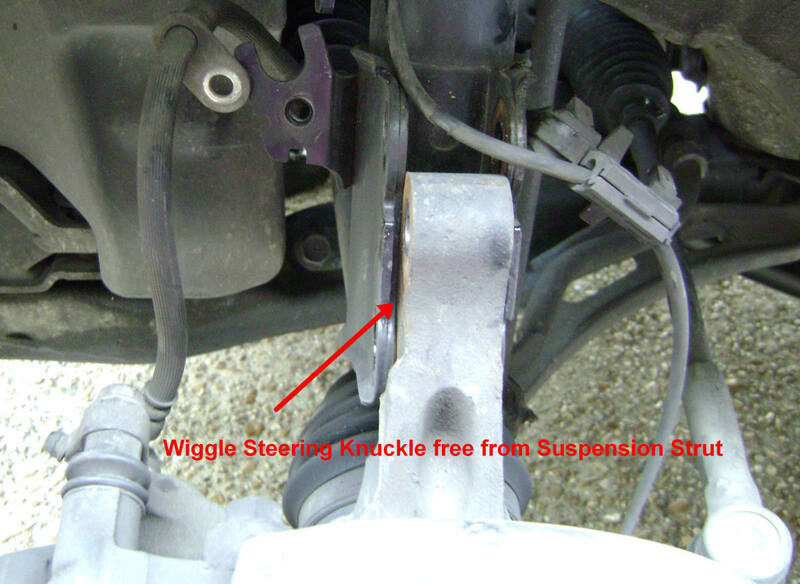 Wiggle and twist the steering knuckle free from the strut. When the two have separated, the axle shaft should have slid partially out. Pull the shaft out with your hands. Removal of this shield will allow pry bar access to the "ears" (pry bar leverage points) of the axle’s inner bearing cup. 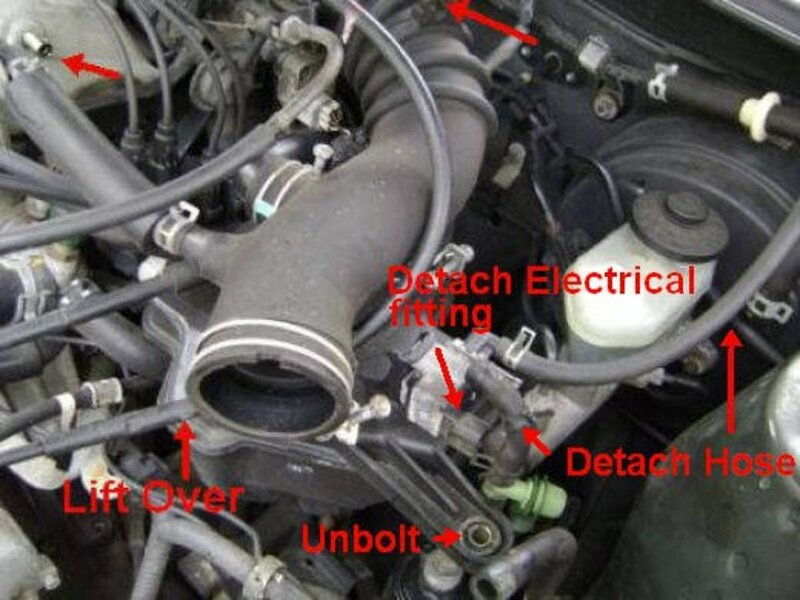 A clear path to the axle shaft can be made by removing the air filter to throttle body intake hose. Removal of the hose should not take more than 5 minutes. *Note: Before putting the hose back on, clean the throttle body plate with some carburetor cleaner solvent. Rotate the axle shaft until one of the lips or ears on the CV bearing cup is pointing up. The transmission must be in neutral to rotate the shaft. After positioning the bearing cup, place the transmission back into "park" to prevent the shaft from moving. From inside the engine compartment, position the tip end of a long pry bar up against the bearing cup ear. The pry bar leverage point will be the transmission housing. Begin applying force to the pry bar… like your body weight. The pulling force being applied to the CV bearing cup must be enough to compress an internal snap ring that prevents the shaft from pulling out and through the differential’s splines. If that does not work, a few sharp hammer blows on the pry bar should provide enough shock force to compress the ring and get the bearing cup moving. Toyota CV snap rings tend to be stronger than snap rings found in other cars (i.e., Honda, Nissan, etc.—Subaru uses compression pins to hold their inner CV axles, but that’s another story). Seal replacement is highly recommended. A lot of seal replacement jobs could have been avoided if the installer of the new axle bothered to replace the oil seal with a new one. The part is around $10 and only adds a few minutes to the job. 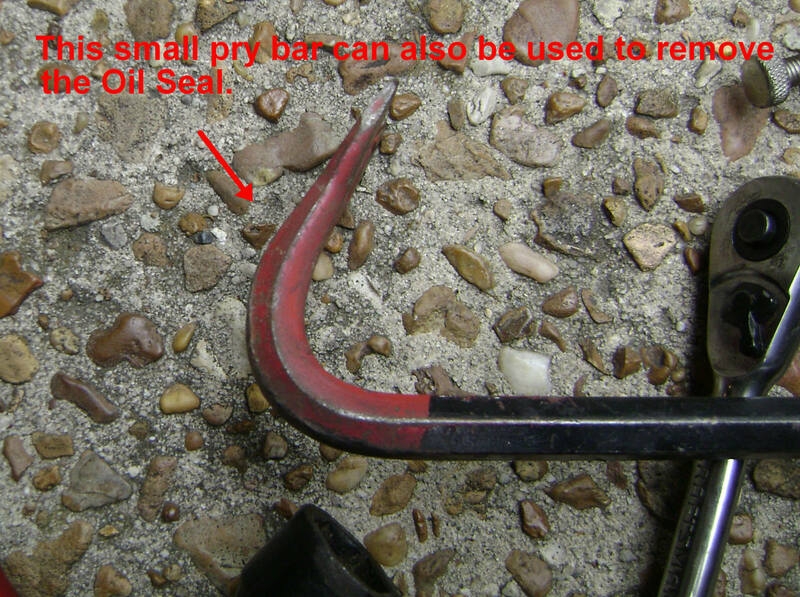 Either a small pry bar or seal removal tool will work. 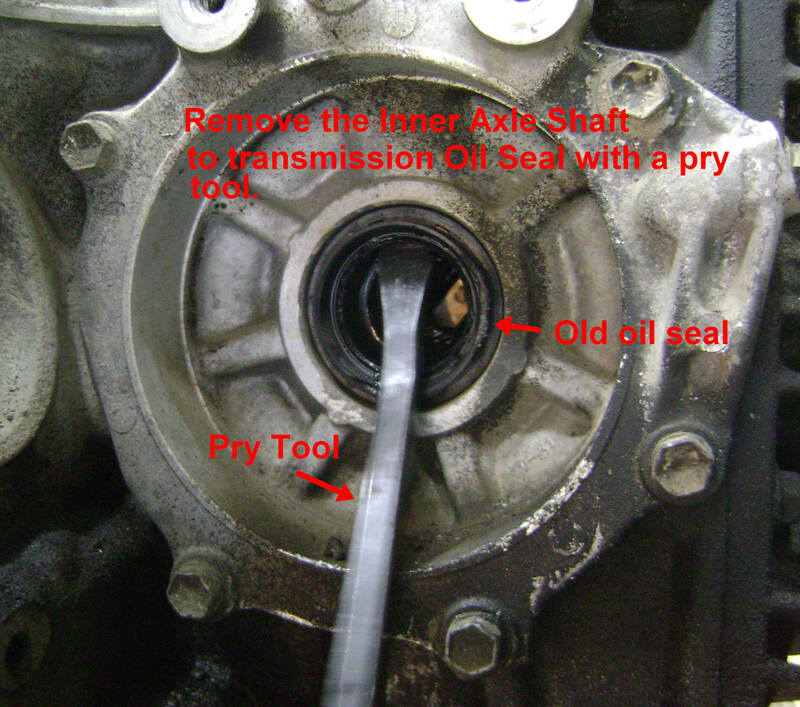 Clean all surfaces and apply a light coat of grease on the transmission seal seat. Position the new seal square in the seat hole. Use a large socket (around 34 mm) to press the new seal in place (or use a bearing press tool like this one). Apply gentle taps on the socket to press the seal and observe the progress. 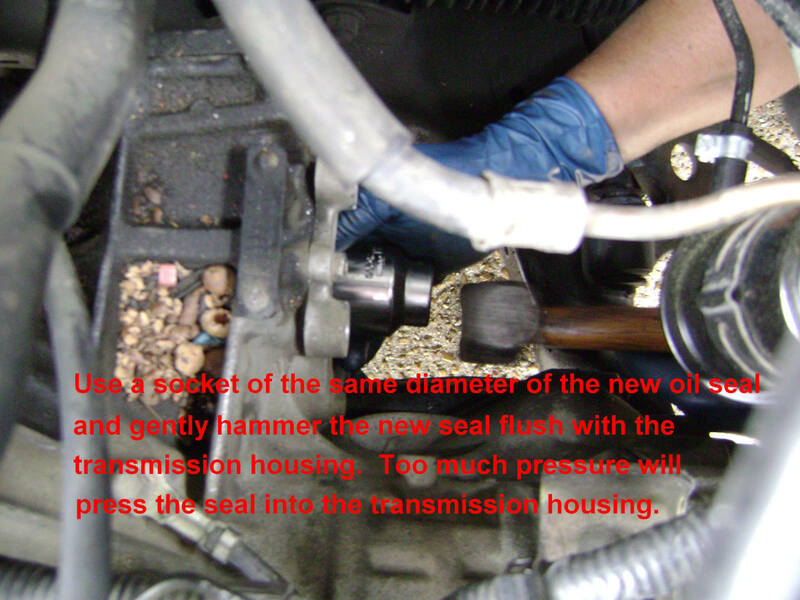 The seal should be flush with the transmission differential housing. Do not allow the seal to recess beyond the housing. If it does, pry it out with your fingers. To prevent damage to the new seal, do not use any sharp tools. Position the inner portion of the CV axle through the transmission differential axle shaft hole. Rotate the shaft until the splines from the shaft catch the splines inside the hole. The shaft should move in approximately ½ “. You need a second person for this next step. With an extra pair of hands, align the axle (including the outer CV bearing cup) positioned straight towards the transmission. Push the shaft towards the transmission (which should compress the inner and outer CV boots), and have your buddy strike the end of the axle shaft gently to get the CV snap rings to compress and move through the transmission’s differential spline. 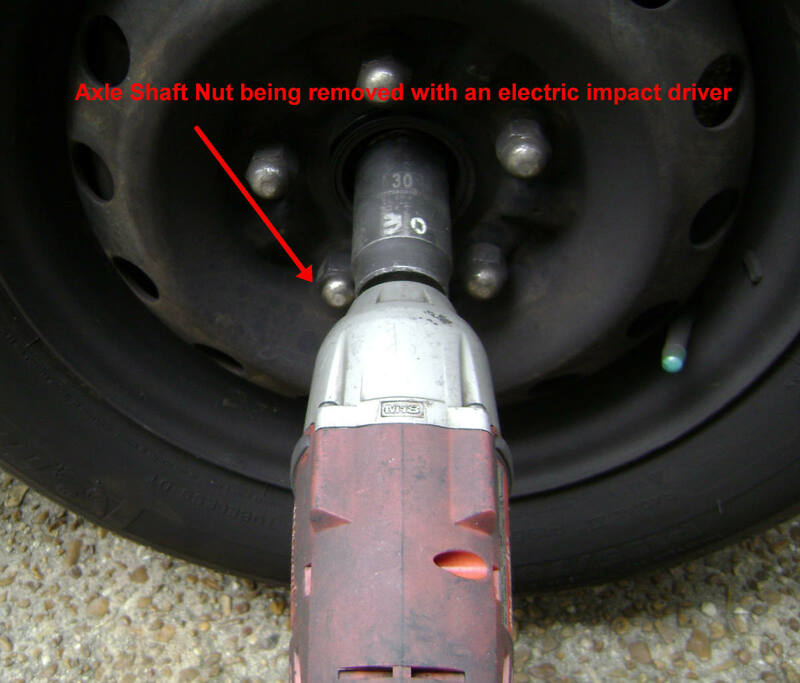 Ensure that the CV nut is on the shaft to prevent damage to the threads. 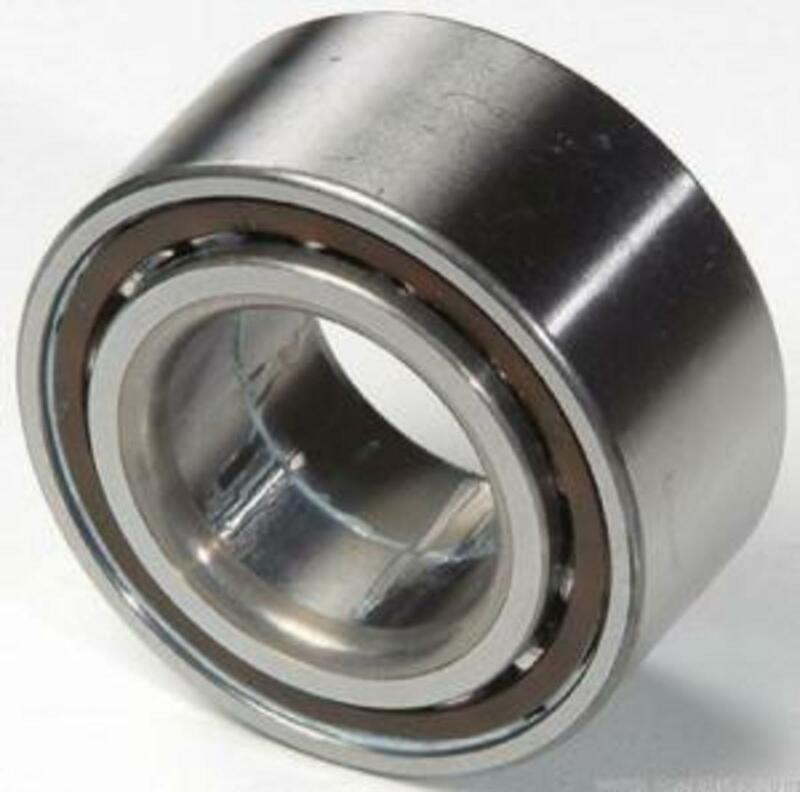 The internal CV bearing must be seated against the CV bearing cup before striking the shaft. If not, the CV boots will be absorbing the hammer blows and the snap ring will not be compressed. Insert the outer CV axle shaft into the steering knuckle. Rotate the shaft back and forth until it aligns with the splines. Then spin on the shaft nut enough to prevent the shaft from sliding out. 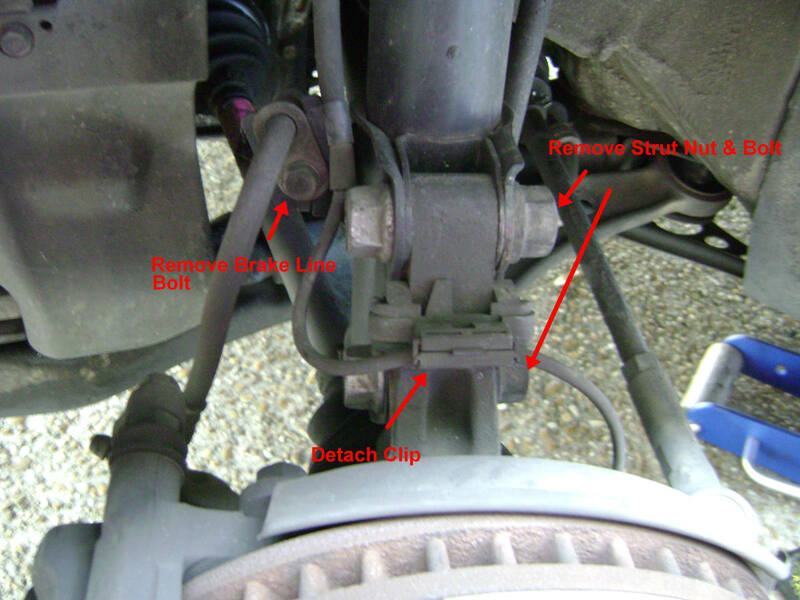 Bolt on the suspension strut to the steering knuckle along with the brake hose bracket bolt. Install the wheel and remove your jack and jack stands. Torque the axle shaft nut to around 150 lbs. Applying your body weight to the breaker bar should put you close to that torque. Fill your transmission with ATF. Double-check the fluid level after the engine is warm. Can you please share your expertise on the snap ring axle retainer on the trans end on a Toyota Camry? How does this work? It's commonly referred to as a retaining ring; not a snap ring. 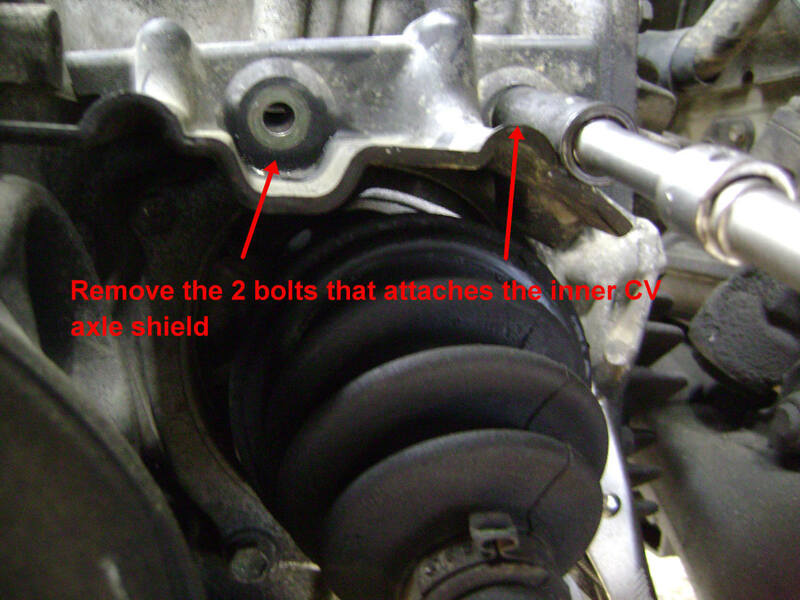 The ring at the end of the inner CV axle joint, is compressed by applying pressure on the joint shaft when the shaft is being pushed into the transmission. The ring will stay compressed while riding on the transmission spines until the shaft has been fully inserted and "bottomed out." The ring then expands to prevent the shaft from being pulled out unless pulled with force, which will compress the ring. How would I pull the inner axle of my Toyota Camry? Use a pry tool and put in between the inner bearing housing and the transmission. You can apply hammer blows to the handle of the pry bar to jar the CV out. 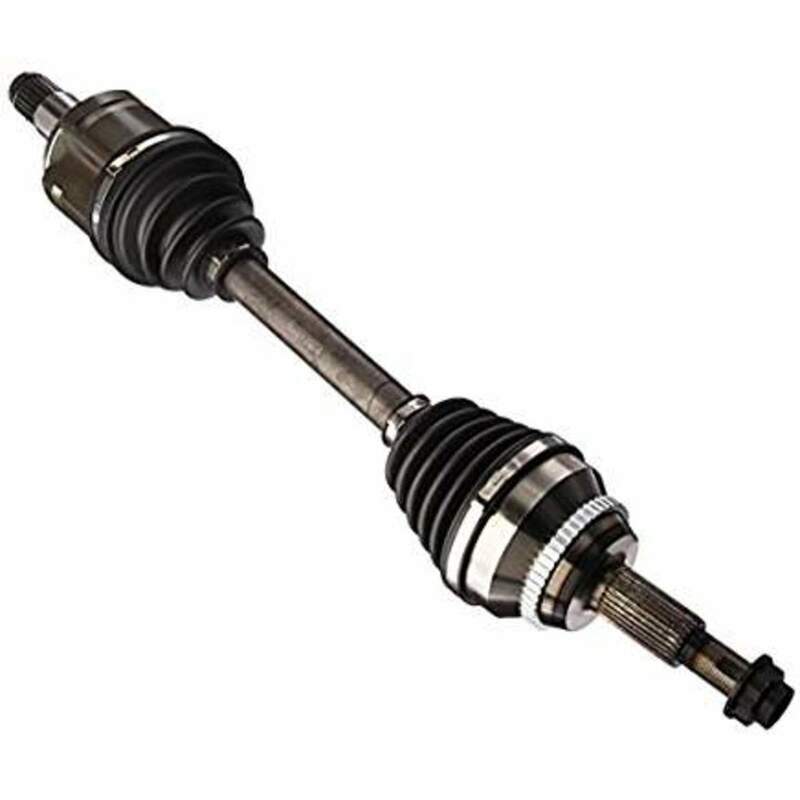 What kind of oil does a 1996 Toyota Camry CV axle use? It doesn't use oil, it uses CV rated axle grease. Can I use a CV axle of a 1995 Toyota Camry in a 1990 Toyota Celica? What if I change the axle seal due to a leak, and it still continues to leak? Either the replacement seal was no good or installed incorrectly. 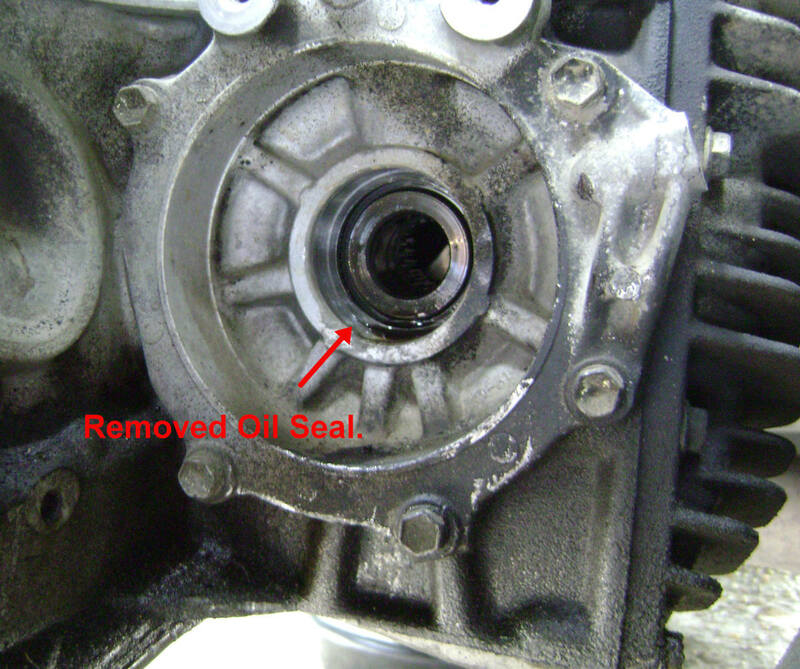 How do you replace the seal on the passenger side of the transaxle of a 2GR-FE (V6) 07 Camry? I noticed that a metal cover ring popped off and was floating around on the long output shaft on the passenger side before the CV axle. 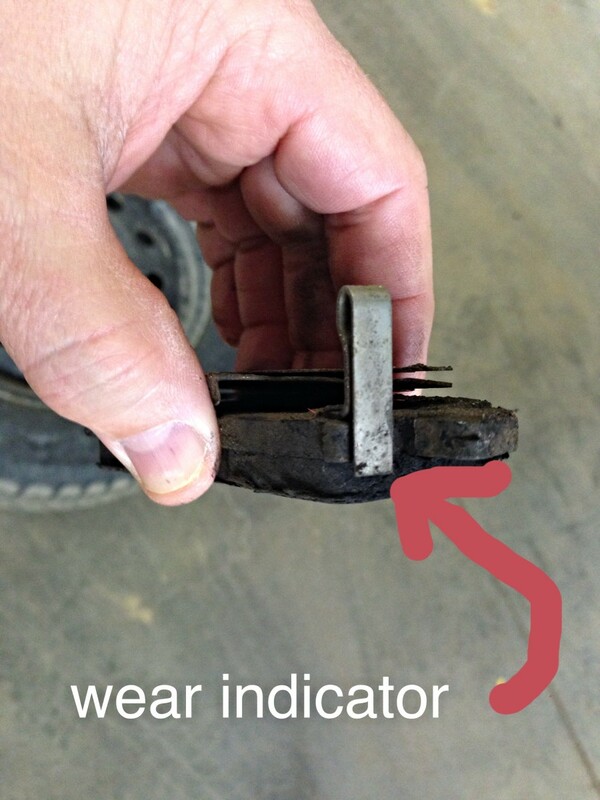 Can a failing driveshaft cause vibration while idling and can it cause an ABS sensor/ABS module to fail thereby? No and no. 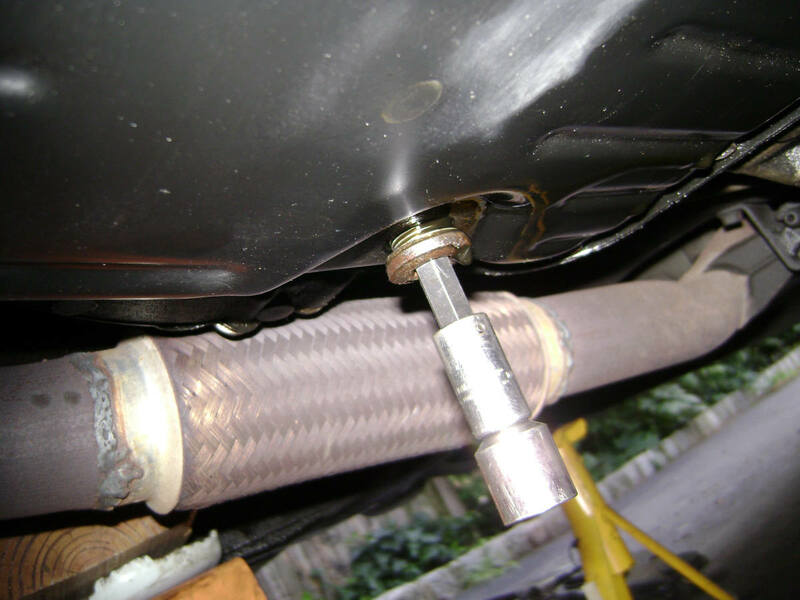 Driveshaft problems are noticed when the car is in motion. ABS sensors are integrated into the steering knuckle and gets its readings off the ABS ring mounted on the outer CV axle. A new axle should come with a new ABS ring. I had a similar situation where I re-booted a CV axle and shaking started happening. Believe either the CV bearings and/or the CV bearing housing was just too worn out. Removing the axle will not damage the transmission. Don't know who told you that. The right (passenger side) axle is a split axle with a center sealed bearing. You have to remove the spring clip on the center bearing support bracket (long nose pliers), remove the bolt on the bottom of the center support bracket and use a long, heavy punch tool to hammer the center bearing out of the support bracket. The shaft going into the transmission is not clipped so you don't have to worry about that. I replaced the front right inner CV axle boot rubber or dust cover of my 2007 Camry V6 XLE 3.5 liters and from then on my car is shaking. I have checked the tires and done wheel balancing and yet it will not stop. I am about to replace the CV axle altogether but I hear that removal of the CV axle will damage the auto transmission. Is this true? Is there any special way to remove and replace this CV axle. You can use a slide hammer with the screw-0n hook attachment for the slide hammer rod. Secure the rod to the CV housing/cup with a large diameter hose clamp to prevent the rod from sliding off. The hook attachment should be on one of the ears of the CV housing/cup. One quick impact will get the CV housing to pop out. This was really helpful. My problem is when I went to pull the axel it seperated and part is stuck in the transmission. I've been trying pry bars but it won't budge. Puller won't fit over it since its recessed in there. Any ideas? the article was helpful, but my camry is a 1988 with a manual transmission. The cables controling the shifters are in the way of the pry bar if the inner cv hub is approached from above, for the removal part. I rented a 3 jawed puller from the auto parts store, after I removed the inner cv boot. with just one pul on the hammer the cv joint popped out,, this is the third time I have replaced the boots on the front axle. NOw I am trying to find a drive axle oil seal to replace the old one in the differential. kind of hard to find. thanks, I hope I can get this back together without other issues. 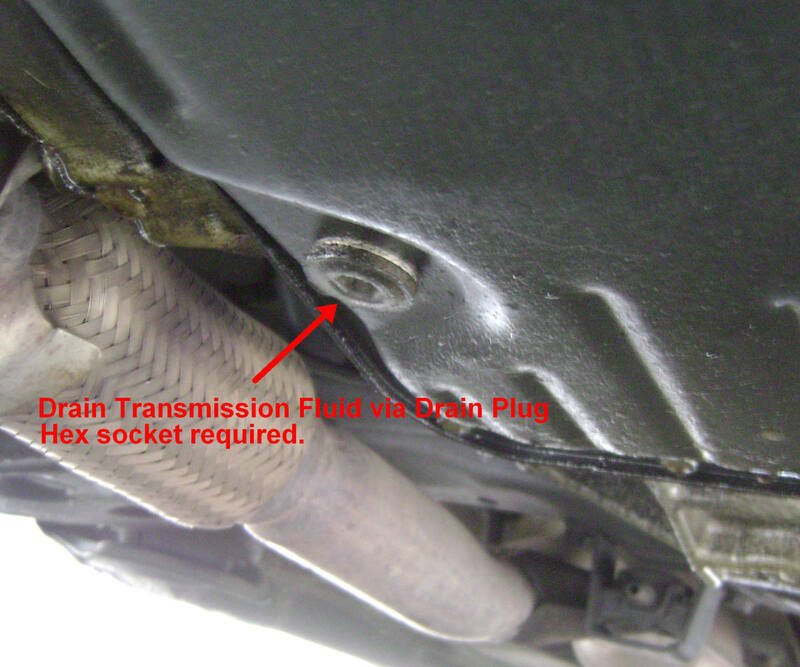 I wrote an article on doing a transmission fluid replacement ... up to a 2001. Doing it on a 2003 shouldn't be that much different. Can the author give me advice on the replacing transmission fluid? The question is that can I just drain out all the old fluid from the transmission tank as much as possible till the last drop of black oil without using the hydraulic pressure pump to do the job. After making sure it is empty, then fill about 10 liters of new oil in. Do you recommend replacing the gasket and the filter in the bottom pan? Is it a must to do or just leave it if there are no signs of leaks. Where is the Inner CV Axle Shaft Seal? Your professional advice is highly appreciated. Thank you , would this also be the same or simlar for early 90's Camrys ? A Camry with the automatic transmission uses automatic transmission fluid in the differential. 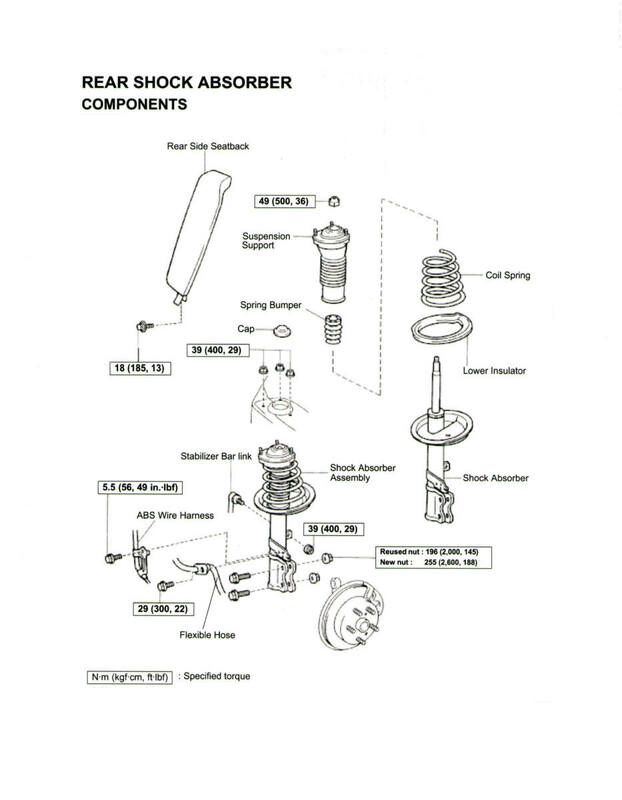 Grab the Haynes manual from your favorite auto parts store, which covers details like this. I am wondering does Camry use ATF fluid in differential case? Someone said if I see leaks between CV and differential, that should be differential fluid. I should add differential fluid after seal replacement. But I didn't find out the differential fluid filling hole. Are you just using automatic transmission fluid ? I've replaced a driveshaft on a manual transmission, and had to use a certain kind of gear oil. But it seems to me that you're just using automatic transmission fluid for this job . Is this correct? Yes ... you tap it in with a socket or makeshift tool of the same diameter. While tapping it in, one side my get pushed in more than the other. In that case, you may have to start over or if a little loop sided, tap the high end until flush. Up to 2001 ... but the newer camry's work under the same principal. What year Camry is this for?